Several Steampunkish challenges going on in March, so I bought some aluminium tape and decided to try embossing with it. I made a bunch of card bases, and now the first one has turned into a card :) Posting for the Craft Barn challenge (CAS), the Country View challenge (Industrial), the Things to Alter challenge (Steampunk), SanDee and Amelie's Steampunk challenge and the Our Creative Corner challenge (Lots of options, I chose the paint-stamp-stencil row from this tic-tac-toe challenge). 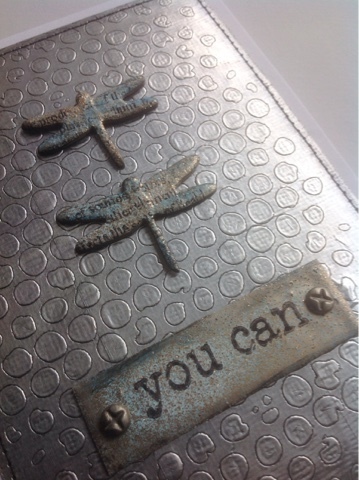 I tried embossing my taped card with a stencil (from Tim Holtz). Maybe I should have put two rubber mats under the card? Not very deep embossing, so even though the pattern is visible, the acrylic paint I used to smudge over it didn't have much to stick on. Very subtle compared to embossing folders. 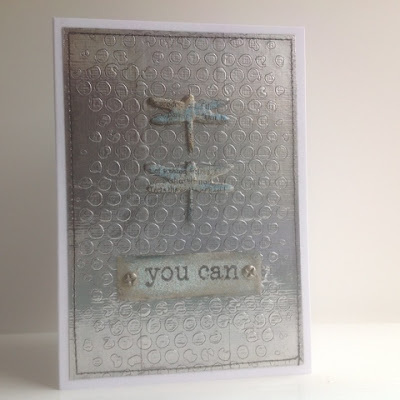 I heat embossed a couple of dragonfly chippies and a piece of card with WOW Atlantic Seaspray and stamped on them with Stazon (text and sentiment from Rubber Dance). Also these were smudged with black acrylic paint, blue alcohol ink and some Archival ink too. I like the way this looks, great for many occasions... and now I just have to figure out what to do with the rest of my aluminium tape experiments! Fabulous card, Kristiina! Industrial and yet beautiful! Thanks for joining the “Industrial" challenge at Country View Challenge blog this month! This is so brilliant! The simplicity of the design makes all the components real stars! Such a great card!